Funatsu gorge was once a very important but at the same time a very dangerous point to Yabe area. People built a wodden bridge many times since mid Edo period, but all flew out. Then, a head of Tomochi district, Shinohara Zenbei, planned to build a stone bridge, and a master carpenter Banshichi from Sobawara village (current Misato Town Wakui) helped him. 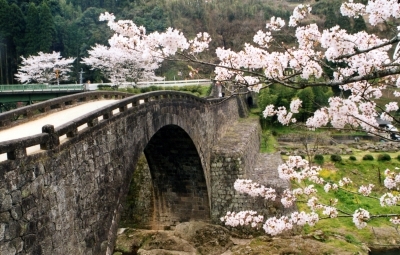 Banshichi was later given a name Shigemi Banuemon to honor his effort of planning this bridge. For the construction, with Usuke from Taneyama district as a leader, as many as 72 stomemasons gathered from all over japan, and theey started building from 1846 for a year. From Meiji to the mid Showa, this stone bridge was used as a local bridge until a new iron bridge was built at the upper course of the river in 1966. 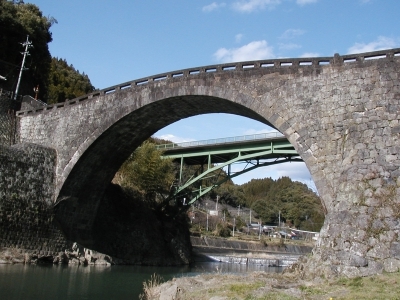 However, even after 160 years, Reidaikyo Bridge is still attracting many visitors. The bridge got no damages from the big Kumamoto Earthquake in 2016. This bridge is 89.86 meters long, 5.45 meters wide and 16.03 meters high. 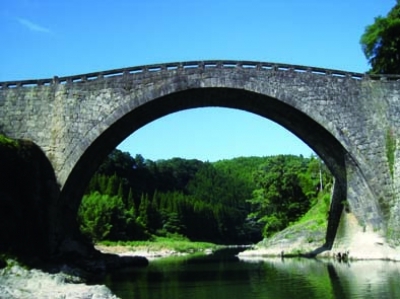 This is the biggest single-arched stone bridge in Japan. It is designated as one of the National Cultural Properties.